Starting school is an exciting new adventure but it can bring with it a whole mixture of emotions, both for children & parents. This great selection of books brings together some of the emotions, situations & experiences commonly felt by young children as they start their scholastic journey. Starting School by Janet & Allan Ahlberg is the perfect book for exploring all the emotions & scenarios of those 'first days'. The lively illustrations offer examples of school activities such as dressing up, meal times, circle time, & these coupled with the easy flowing text make this book a comforting read for any young child starting their school journey. Topsy & Tim Start School by Jean & Gareth Adamson is one of Minnie's favourites! Again it provides examples of school day activities, & offers a gentle reassuring story. Lucy & Tom Go to School by Shirley Hughes is a must for any younger siblings not yet old enough to start school. The classic illustrations cleverly depict the emotions of Lucy as she experiences both good & not so positive situations at school. A good book for encouraging confidence & self belief. I Am Too Absolutely Small For School by Lauren Child is a real winner in our house! 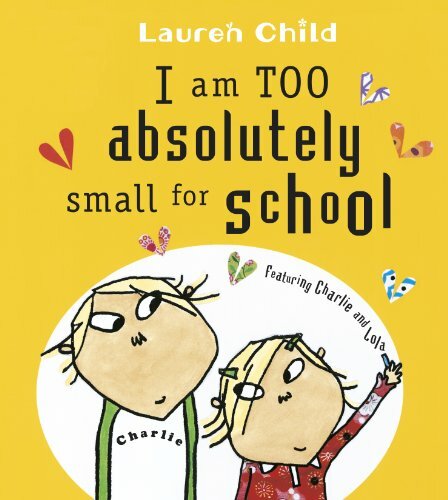 Lola just isn't sure she's ready for school, & faces numerous fears & worries, but Charlie is there to reassure her & soon Lola LOVES school! Fun, engaging & the perfect book for children starting school. Harry and The Dinosaurs Go To School by Ian Wybrow tells the story of a nervous Harry on his first day at school. He doesn't quite know what to expect, & is even more unsure of how he feels when he has to leave his precious bucket of dinosaurs in the cloakroom. Suddenly he notices another classmate who looks unhappy & focuses on how he can help them feel better. Great for encouraging confidence & empathy. The Kissing Hand by Audrey Penn. 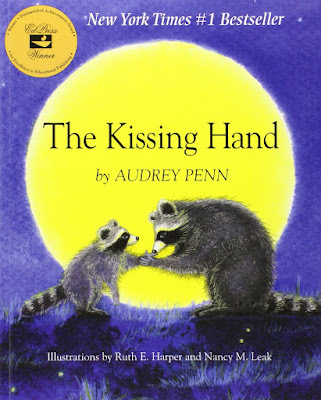 If I could choose a favourite book from this selection this would be mine, it had me in tears the first time I read it & I would recommend it to every parent who has a child starting preschool, Nursery or School. A beautiful story full of reassurance, love, & encouragement. I know this book will help Minnie & me through that first week of term! 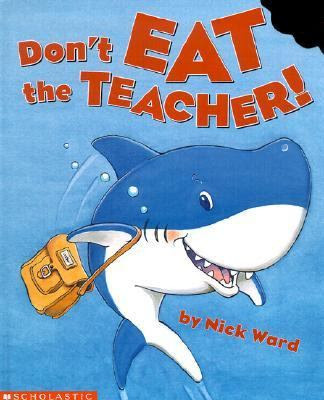 Don't Eat The Teacher by Nick Ward is a great fun read & is sure to create lots of giggles. I loved the bold bright illustrations & energy of the story. Sammy the Shark starts school with bundles of energy, he's so excited but maybe he's just a little too energetic. A Pocketful of Kisses by Angela McAllister tells the story of Digby a little mole who is quite unsure of himself & not at all happy about starting school. His mother fills his coat pocket with kisses & gradually Digby becomes more confident & happy, making friends & helping classmates along the way. Another great book for parents & children. Bella Goes to School by Ian Whybrow tells the story of Bella, a young rabbit who is a little unsure about starting school. She worries she can't write yet, or dress herself, but soon her family & friends help her realise just what a great learner she is! Another great book for calming fears & encouraging self-esteem.